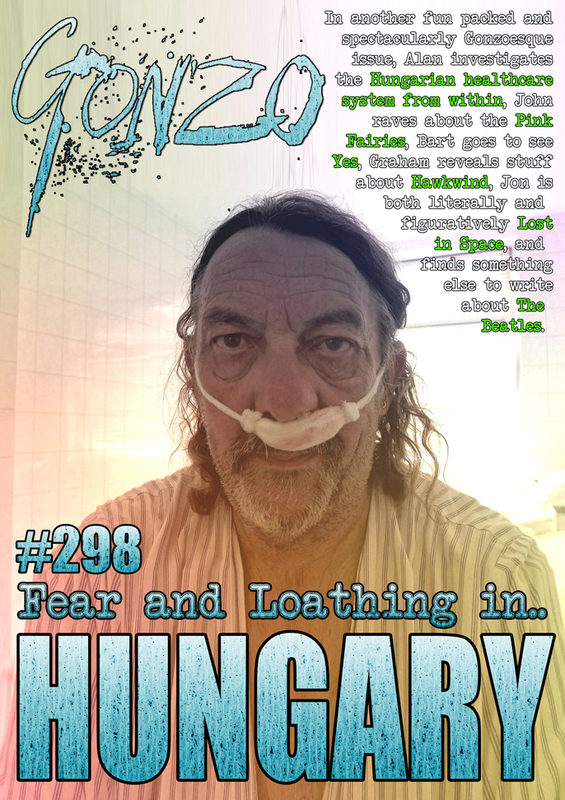 In another fun packed and spectacularly Gonzoesque issue, Alan investigates the Hungarian healthcare system from within, John raves about the Pink Fairies, Bart goes to see Yes, Graham reveals stuff about Hawkwind, Jon is both literally and figuratively Lost in Space, and finds something else to write about The Beatles. And there are radio shows from Strange Fruit, Mack Maloney, AND Friday Night Progressive, AND there are columns from all sorts of folk including Kev Rowlands (UMM IT'S ACTUALLY JUST HIM THIS WEEK), because Neil Nixon, C J Stone, the irrepressible Corinna, Mr Biffo and Roy Weard are on hiatus. 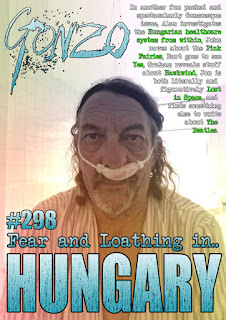 There is also a collection of more news, reviews, views, interviews and red kangaroos who've lost their shoes (OK, nothing to do with the largest extant macropods who are in a quandry with regards their footwear, but I got carried away with things that rhymed with OOOOS) than you can shake a stick at. And the best part is IT's ABSOLUTELY FREE!!! but please remember us in your thoughts and prayers. Roger Daltrey, Nick Cave, Wilko Johnson, Shir Ordo, paul McCartney, Led Zeppelin, Morrissey, Yoko Ono, David Bowie, Billy Gibbons, Z Z Top, Patrick Williams, Lucy Ferry, June Jacobs, Elbert Howard, Rick Wakeman, Michael Bruce, Natural Gas, Roger Waters, Canned Heat, UPF, Universe Infinity, Unruly Child, Vantomime, Vespero, Zero for Conduct, Abjection Ritual, Aborted Fetus, C J Stone, Hawkwind, Evelyn Waugh, The George Garabedian Players and the Awful Trumpet of Harry Arms. ON THIS DAY IN - 1676 - "King Phillip's War" came to an end with the killing of Indian chief King Phillip. The war between the Indians and the Europeans lasted for two years.